This month’s kit is all about making dreamy, fairy tale cards with build-a-scene stamps and dies. They can be as simple or challenging as you want to make them. There are several great videos on the subscription site that cover tips and techniques which I found really helpful. Sara Davies, the owner of Crafter’s Companion, is really so generous with her kits. The March box has 125 items including metal dies, clear stamps, colored cardstock, ribbons and 19 cards in several shapes and sizes with coordinating envelopes. My kit was delivered with auto-ship through HSN as always. You can check out Crafter’s Companion website for more information. This kit is truly a wonderful bargain. Each kit offers different items and will show you new techniques. There is a Facebook group that you can join once you subscribe which provides lots of community support and loads of examples; plus, Sara also has a monthly card kit site that you can refer to for demos/project pages. The link for the March kit and videos are not appearing on the main site for some reason, so I am attaching it separately (hopefully it will be added to the main site soon). In addition to this kit, I did use a few products from Crafter’s Companion to show that you can mix and match. I used the new peony collection layering stamps and I also used one of the layering dies from the Die’sire card base set – Ruth – to cut out a frame on one of my diorama cards. All of the inks used were Spectrum Noir Harmony inks. To secure my projects, I used a combination of tape adhesive and wet glue for most of the projects, but I also used a 3-D silicon glue to help raise some of my elements. Crafter’s Companion sells a 3-D glue gel that adds dimension depending on how thick you lay it on. I highly recommend this glue!!! 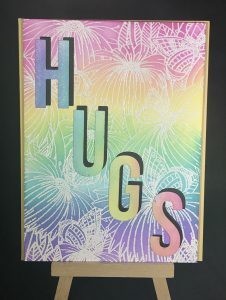 I also love the Collal all purpose wet glue – it works great on all sorts of cardstock. I would also recommend the Crafter’s Companion glass mat. It is a true game changer. Once you work on a glass surface you will agree! The first card was definitely the most challenging. There are a lot layers to it but it is not difficult. The diorama cards are included and I used gold mirror card behind the inked leaves to make it look like the sun was reflecting through. I just love how this turned out. The next card is not “straight from the box” I thought it might be nice to show another shape rather than the leaves. The fairy is overlooking the gorgeous peony flowers and it still looks magical. These last two cards are very different because I only used the stamps. Creating diorama cards can be time consuming especially if you are learning. My advice is to take it slow. You will get better with each attempt. In the meantime, enjoy the colorful paper and stamps in the kit and create something you like. I hope you enjoyed all of these examples. I found this kit to be very versatile because you can create quick cards but it also gives you the opportunity to make more difficult cards so that you can challenge yourself. Please feel free to share your creations – I would love to see them!! Happy Crafting! !